Our conservatory windows were hidden under layers of grime courtesy of the equinoctial gales. I gave them a wash a few days ago. The change was profound. I have something of a superstition that if you sweep or scrub the front doorstep you will receive a welcome visitor. The very next morning I was surprised to find the still warm body of a song thrush on the front step. 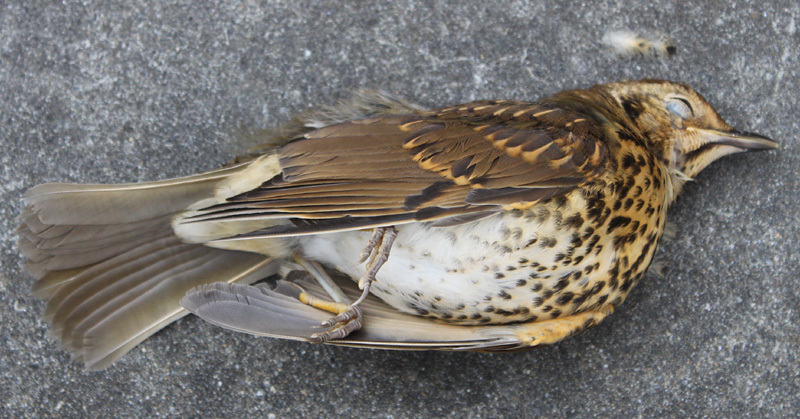 I haven’t seen thrushes around here before – how sad to find the first one dead. And worse, I was to blame. The beautiful thrush – wild and free – had mistaken the clear glass for an open flight path. I’ve been thinking about what a dangerous time it is moving across the border from one year to the next. 2010 turned out to be a year full of great things for me – often the gifts were concealed in wrapping that were painful to remove. Some things worked really well, some were lucky escapes. I received a precious gift in one amazingly rare second chance – my mother was given a few hours to live back in August somehow rallied and I spoke to her by phone yesterday. A second chance to speak to a lost loved one – even for just a few moments – how much more could a person ask for? We all make these crossings through the borderlands. The here and now, the before and past. The new year is the one we all make together. Our calendars seem to squeeze up tight in December, and then seem suddenly free in the new year. Opportunities abound – suddenly it’s like one of those daisy strewn meadows and you’re a barefoot kid again, running here and there. We all make large and small changes every day. I sometimes feel like a tiny mouse in a maze running trying this way or that. Will this turn out good or bad? Sometimes you have to make what seems like a giant leap of faith to jump through the border on to a new plane of understanding. Sometimes this change is something you are willing and can make for your self. Other times external energy or events sweep over you like tidal wave and you splash around choking and gasping and trying to find the right way up. It can be painful. It almost always is frightening. No matter how you cross the borderlands you always have to leave something behind. It’s a blessing if what you leave behind can be valued by others. I buried the thrush under our struggling lemon tree. I hope the thrush’s free spirit and joyous song infuse the lemon tree with uplifting energy. Today, I was delighted to see a live song thrush in our garden. 02. Every day is an opportunity for a new beginning. 01 Jan This entry was written by Lynsey, posted on January 1, 2011 at 8:15 pm, filed under celebrations, family, friends, gratitude, home, love, passion, self care and tagged blessing, change, equinoctial, leap of faith, lemon, mouse, mouse in a maze, song thrush, superstition. Bookmark the permalink. Follow any comments here with the RSS feed for this post. Post a comment or leave a trackback: Trackback URL.